And now the case of the hot pepper and the horrible headache. NPR's Richard Harris took a closer look at this medical curiosity. RICHARD HARRIS, BYLINE: A young doctor named Kulothungan Gunasekaran has a knack for finding odd events. On nine separate occasions, he has turned an unusual observation into a published case report in the medical literature. KULOTHUNGAN GUNASEKARAN: So this one, I think, is the most interesting one which we encountered. HARRIS: Gunasekaran was finishing his residency at the Bassett Medical Center in Cooperstown, N.Y., when an otherwise healthy 34-year-old man came to the emergency room with a terrible headache. It had come on incredibly suddenly. Doctors call this a thunderclap headache. And the man's problems started when he ate an exceptionally spicy Carolina Reaper pepper. GUNASEKARAN: He ate the pepper. He developed the headache, which got better. He went home. HARRIS: But relief was not to last. Another thunderclap headache sent the unidentified man to the emergency room. Why did he eat this pepper? GUNASEKARAN: He was in a contest. HARRIS: And he paid dearly for the experience. Doctors ran a battery of medical tests and, ultimately, a brain scan called a CT angiogram. GUNASEKARAN: Which showed some narrowing of blood vessels in the brain. HARRIS: That could explain his symptoms. The man was admitted to the hospital to treat his prolonged headache. Gunasekaran wasn't his doctor but caught wind of the story and decided to write it up for a journal called BMJ Case Reports. His research led him to YouTube, where - no big surprise - there are plenty of videos of people trying to eat whole Carolina Reaper peppers. UNIDENTIFIED PERSON #1: Today, me, Omar and the boys are going to be trying the Carolina Reaper challenge. LIZZY WURST: Today, we're going to be eating the Carolina Reaper pepper. These are the world's hottest pepper. Oh, my god. (Screaming). HARRIS: The occasional ambulance ride aside, Gunasekaran's conclusion was that most people didn't suffer dire consequences from eating these peppers. GUNASEKARAN: On YouTube, they were eating those peppers, and they were able to tolerate. HARRIS: The case report was a new one on Todd Schwedt, a professor of neurology at the Mayo Clinic and an expert on thunderclap headaches. TODD SCHWEDT: So I had never heard of one being triggered by a Carolina Reaper or any other chili pepper. 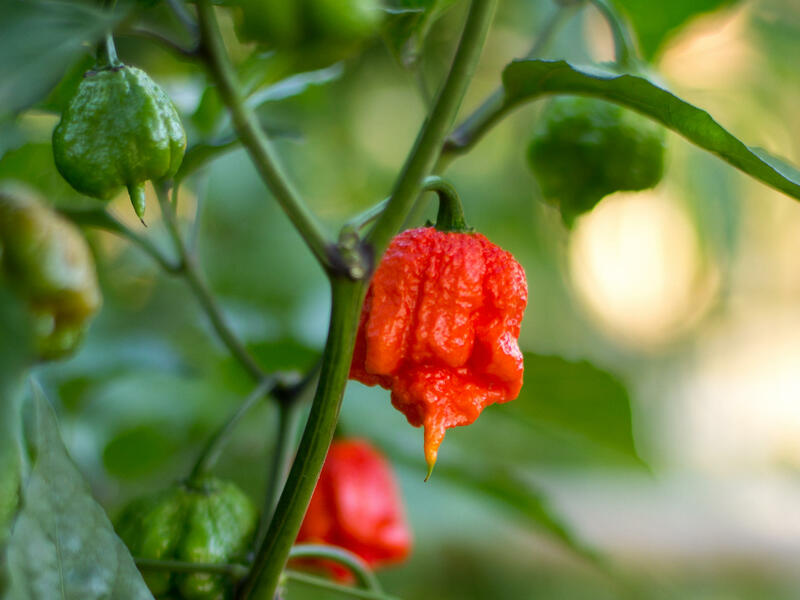 HARRIS: Schwedt says it makes sense, though, because the active chemical in hot peppers, capsaicin, can constrict blood vessels in the brain, as happened to the patient in New York. The man's symptoms were classic for a thunderclap headache. SCHWEDT: Folks will describe this as if they felt like something exploded in their head, or they got hit in the back of the head. So it's really how quickly it becomes very severe that makes it a thunderclap headache. HARRIS: And it's serious business. Sometimes these headaches can be triggered by a dangerous event, like a burst or torn blood vessel in the brain. SCHWEDT: When someone has a thunderclap headache, it should be considered an emergency. And it needs to be evaluated urgently. HARRIS: The study of the pepper eater had a happy ending. Five weeks later, he returned to the hospital for another scan. And the blood vessels in his brain were back to normal. Dr. Gunasekaran has now moved on to Henry Ford Hospital in Detroit and is keeping alert for more curious cases to report. Richard Harris, NPR News. (SOUNDBITE OF HIDDEN ORCHESTRA'S "SPOKEN (SUBMERSE REMIX)" Transcript provided by NPR, Copyright NPR.